If you’re looking for the ultimate showering experience, you might want to consider equipping your bathroom with a rain showerhead that features rain-like drenching spray for complete body coverage and total relaxation. ​By installing a rainfall showerhead in your bathroom, you will get water streaming out like natural rain all over your body, allowing you to relax and providing you with a "lightened" feeling after a long and stressful day at work. High quality luxury rain showerheads are designed from durable non-corrosive materials that are very easy to clean, and they usually have an aesthetically pleasing look which will add style and beauty to your bathroom. ​Finally, note that most of these showerheads are usually equipped with a much larger spray surface than ordinary showerheads, and therefore you can easily share your shower with your beloved one for the utmost sensual showering experience! 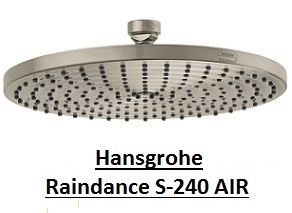 This article will first compare the Moen S6320 Velocity and Hansgrohe Raindance S-240 AIR rain showerheads. These were not just the most popular among Amazon customers at the time this article was written, but they had also received excellent reviews from most Amazon buyers at the time this article was written (an average of at least 4.5 stars each out of 5 stars!). - Full Spray Rain: In this mode the showerhead gently trickles water drops all over your body for a calming and soothing rain shower. It uses all 100 nozzles. - Concentrated Rinse: In this mode the showerhead uses only 30 nozzles (the center ones) and increases the spray intensity. Hansgrohe comes with a single spray mode which is AIR-injection rain spray. It actually produces air-filled drops of water rather than streams. All 180 nozzles are used and it feels more like real rain! Moen is offered in Antique Bronze, Brushed Nickel, Chrome and Oil Rubbed Bronze. Hansgrohe is offered in Chrome and Brushed Nickel. ​Note also that the prices of these showerheads vary depending on the material and color selected. It uses Moen’s proprietary advanced self–pressurizing immersion rainshower technology which channels water through a spoke design, concentrating and magnifying the water's natural force, enhancing drastically the showering experience. Moen claims the Velocity showerhead to have three times more spray power than most rain showerheads. With a flick of a lever, you are able to direct water flow to just 30 nozzles for a concentrated more intense rinse, or expand it to flow out of as many as 100 nozzles for a calming and soothing rain shower. The spray head is 8-inch in diameter, and it delivers a maximum water flow of 2.5 gpm (gallons per minute). It uses the proprietary AirPower technology that enriches the water with air, resulting in soft, pleasant water droplets on your skin. The unique invigorating AirPower can be felt on your whole body when showering. Water enriched with air makes the water droplets plumper, lighter and softer, and this means that the water can be used more effectively. With the Air-jet technology you can FEEL EVERY water drop hitting your body, kind of like standing in the rain! The spray head is 9-inch in diameter and has 180 no-clog spray channels. It delivers a maximum water flow of 2.5 gpm (gallons per minute). Note that this showerhead is rather heavy for its size. Therefore, make sure your shower arm is strong, or have your pipe come down from the ceiling.